In the morning breakfast was laid out on the table. There had been a couple who also stayed the night but they had left much earlier. It was the best breakfast yet. 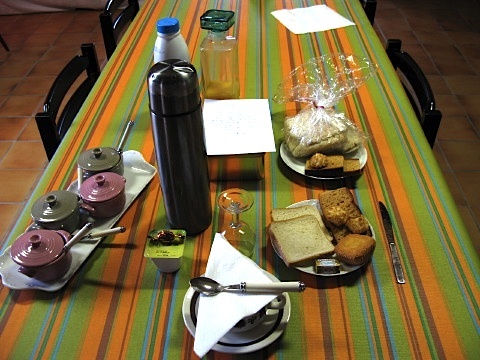 Breads, ginger cake, coconut cake, yoghurt, fruit juice and a flask of fresh coffee. There was even a note from the lady of the gite apologising for not being there. The note contained a weather forecast for the day as well as good wishes for the Way. I left town but it was not long before the first test of the day. In woodland I was attacked by mosquitoes. There were a lot of them and all were intent on biting me at every opportunity. For a kilometre or more the walking was not a pleasant experience. The path of the Way turned into a road and for a long time it was a trudge on the hard surface. I was mindful that this type of walking could cause blisters even after many weeks of walking. I stopped a couple of times to check for red marks on the feet indicating the start of a blister. At Abbaye de Sauvelade there was an church built in about 1250. It was all that remained of the monastery that once welcomed pilgrims. There was a statue of Saint James inside. I found it touching that many had hung scallop shells on the statue and placed prayers in front of it. There were many quite desperate notes and prayers for loved ones and many prayers for hope. I had a coffee at the cafe nearby and decided to buy a tin of beans and sausages and six muesli bars. When the cafe owner asked for €8.60, I put them back and settled for a chunk of bread and the coffee for a couple of Euros. Many ups and downs followed as the Way progressed through the steepening foothills of the Pyrenees. It was not that hot but it was humid and the climbs made me sweat a lot. You could always tell when you were near the top of a climb as the wind freshened a little and the temperature dropped slightly. I only ever stopped at the top of any climb for a rest. It was always easier to start off downhill. The last descent gave a view down into a wide valley and soon after I could see Navarrenx in the distance. Near the town there was a large flock of sheep in a field. I realised it was the municipal sports field and there were no fences. Nearby a dog stood guard watching each movement of its flock. It darted towards any stray sheep and chased them back to the flock before returning to its sentry position. The shepherd leant lazily on his crook at the other side of the field. The scene reminded me of the shepherd in ‘The Alchemist’ by Paulo Coelho. 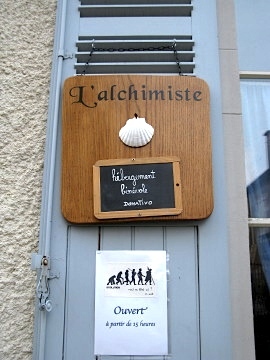 One hundred metres later I saw a sign for a gite called l’Alchimiste. I would go there as the Way had dictated. 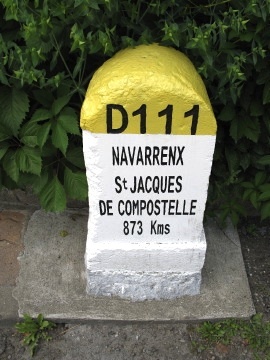 As I entered the old walled town I was reminded again of the distance still to go to Santiago – 873km. Navarrenx was fascinating and the first town in France to be fortified with Italian style ramparts. They were built in the 16th century and remained largely intact. 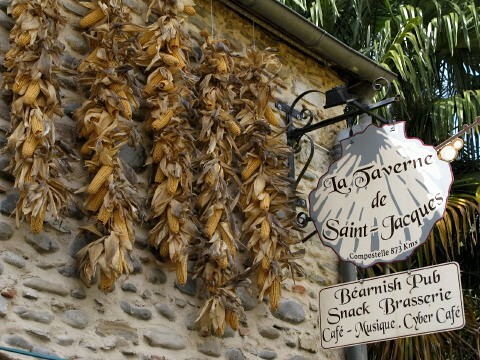 I soon found the gite l’Alchimiste and Jean-Gaëtan, the owner, appeared. He was a deep slow speaking person full of interest in everyones tale. 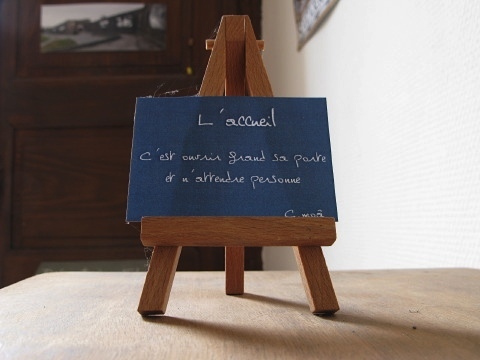 We chatted as he quizzed me on the best places to place some hand painted chalk boards to advertise the gite. He wanted only quiet places in the middle of woodland. I marked such places from memory in his copy of the Miam Miam Dodo. He would go one day to ensure they were suitable locations. Jean-Gaëtan was a mystical and fascinating person. He was a painter who signed his paintings ‘C. Moa’ (its me). 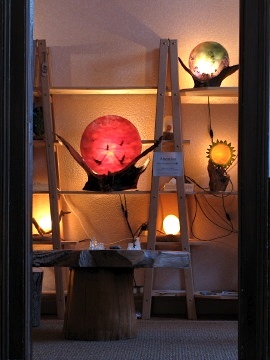 He transformed old branches from trees into lamps. He was a philosopher too and everywhere in the gite there were quotes and gems of inspiration. There was one such quote near the entrance to the gite that read ‘The welcome – to open the door wide and wait for no one’. An interesting place. Others arrived including Francine and Carol from Montreal in Canada. I had met them a couple of times before. They were lively and chatty characters and we all sat for a while catching up on news. Marie and Marie-Hélène also arrived and we all had a wonderful meal in the garden later that evening. The rest of the evening was spent by the fire discussing philosophy. My French abilities ran out as I grew more tired and it was time for bed. 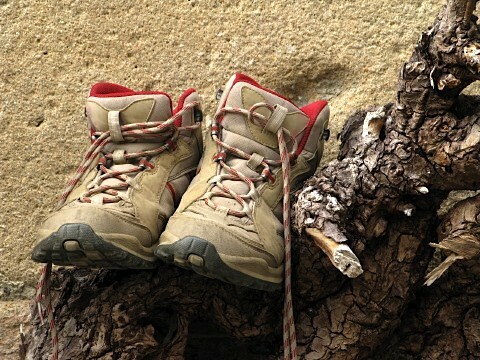 TIP: As soon as you feel any rubbing on your feet take off your boots and check the feet for red or tender marks. Cover those areas immediately to prevent the formation of a blister. This tip enabled me to complete the walk. Some I met endured real discomfort by ignoring the signs of blister development. Some had to give up due to blisters. 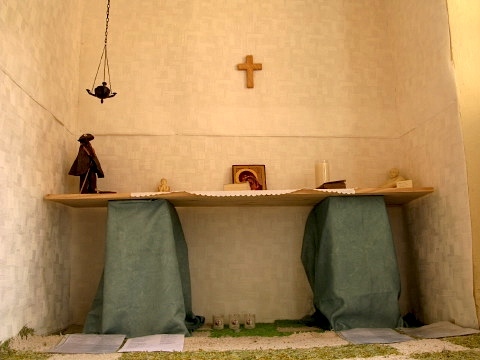 This entry was posted in From the Way and tagged Via Podiensis, Way of Saint James, Week Five. Bookmark the permalink. Post a comment or leave a trackback: Trackback URL.